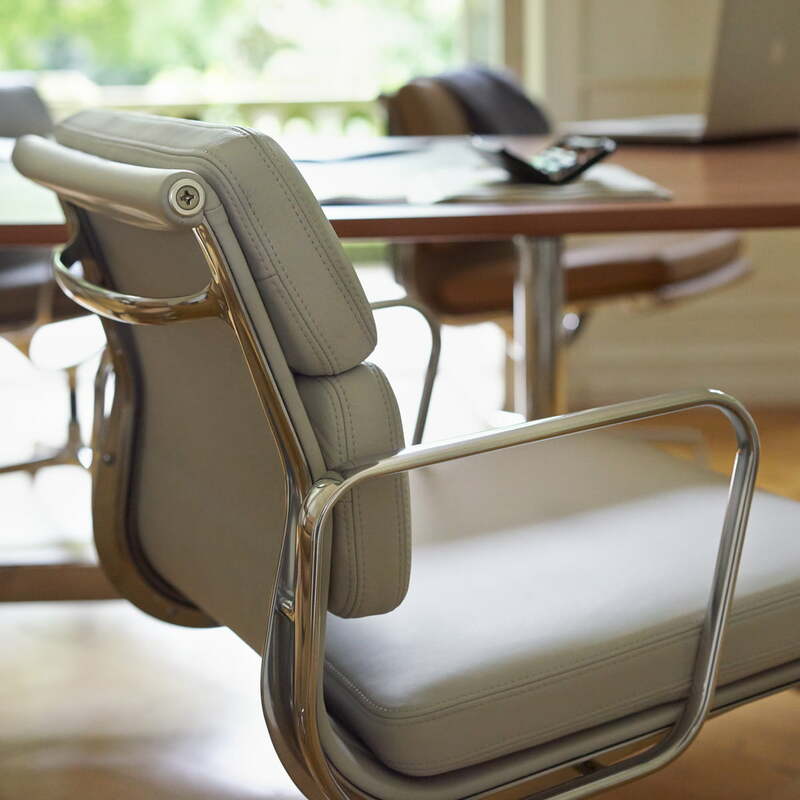 The design of the Vitra Soft Pad office chair by Charles & Ray Eames dates back to 1969. It is similar in construction and in shape to the structure of the aluminum chair. 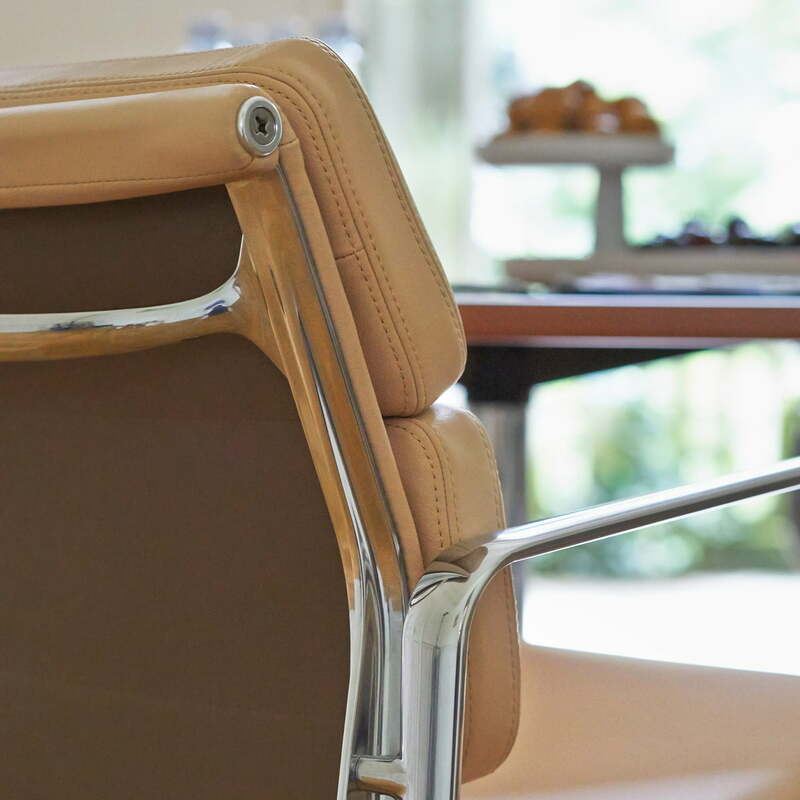 The stitched upholstery creates an interesting contrast to the slim aluminum frame. 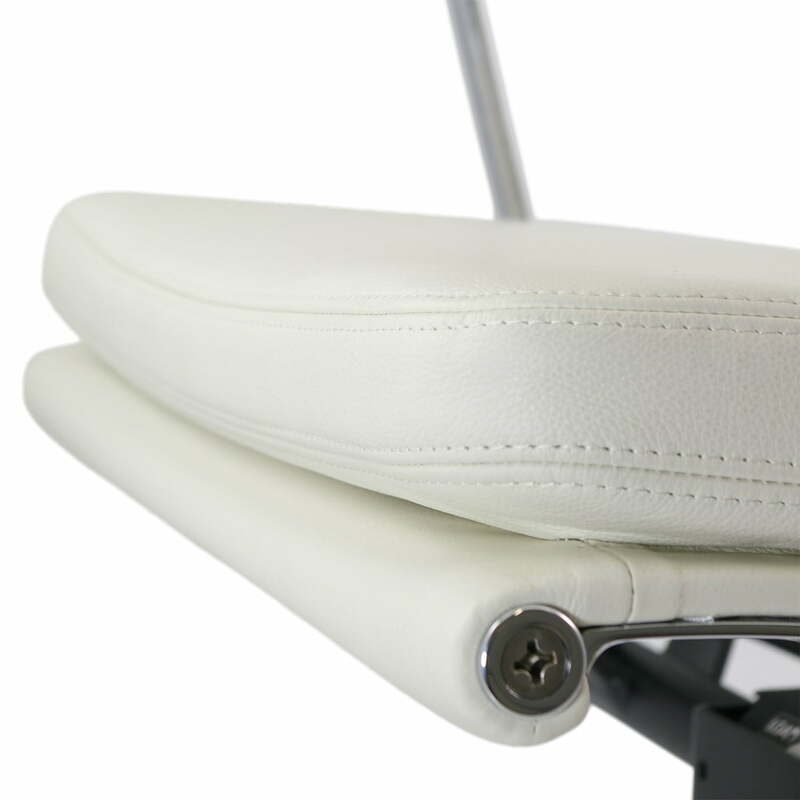 This makes the Soft Pad Chair softer and more luxurious, without losing any transparency or clarity. 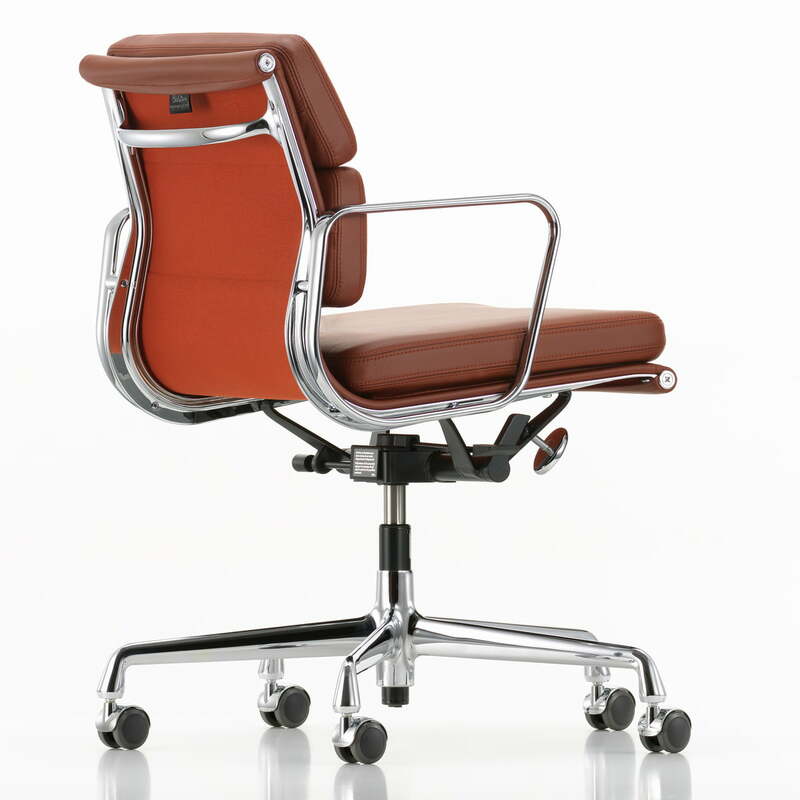 The models EA 217 and EA 219 are office chairs from the chair family Soft Pad Group by Charles and Ray Eames. Thanks to their representative appeal, they are particularly well-suited for management areas. The tilting mechanism can be adjusted to the user's weight and offers a high degree of comfort in conjunction with the soft padding. 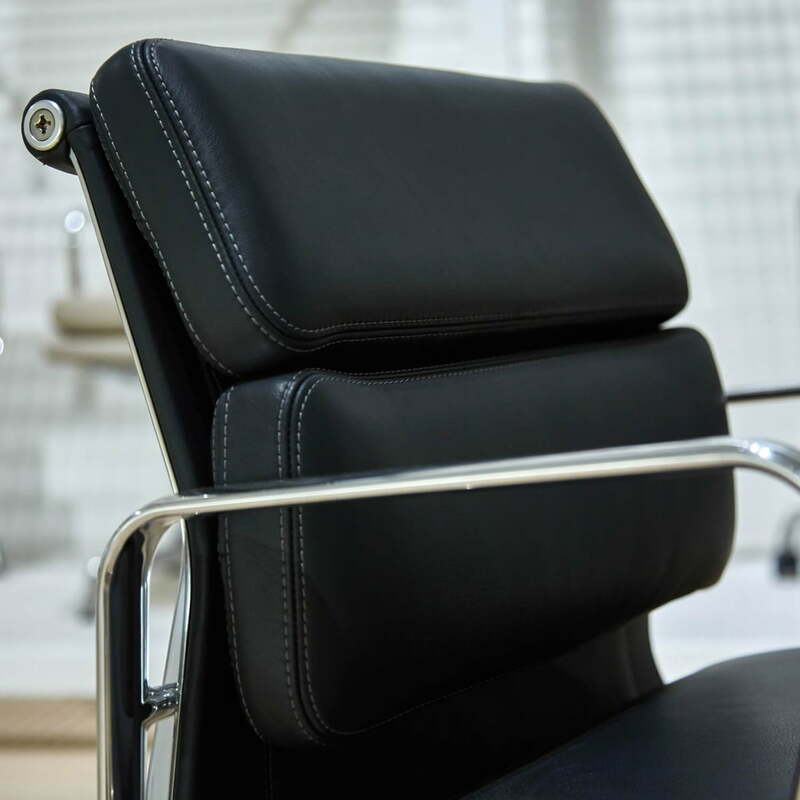 The Soft Pad Chair EA 219 differs from the EA 217 with its higher backrest. The EA 217 swivel office chair has a five-star base with castors and is optionally available without armrests. The seat height can be adjusted via a gas spring. The adjustable back mechanics can be locked in an upright position. The cover for the upholstery out of polyurethane foam with three sewn on cushions is available in leather of various colours. The sides profile, tension brackets, armrests and feet are in die-casting polished aluminum (with black castors) or chrome-plated. Can be delivered with hard castors for carpet floors or soft castors for hard floors. Lateral single image of the Soft Pad Chair EA 217 with chromed armrests and leather in Snow by Charles & Ray Eames for manufacturer Vitra. 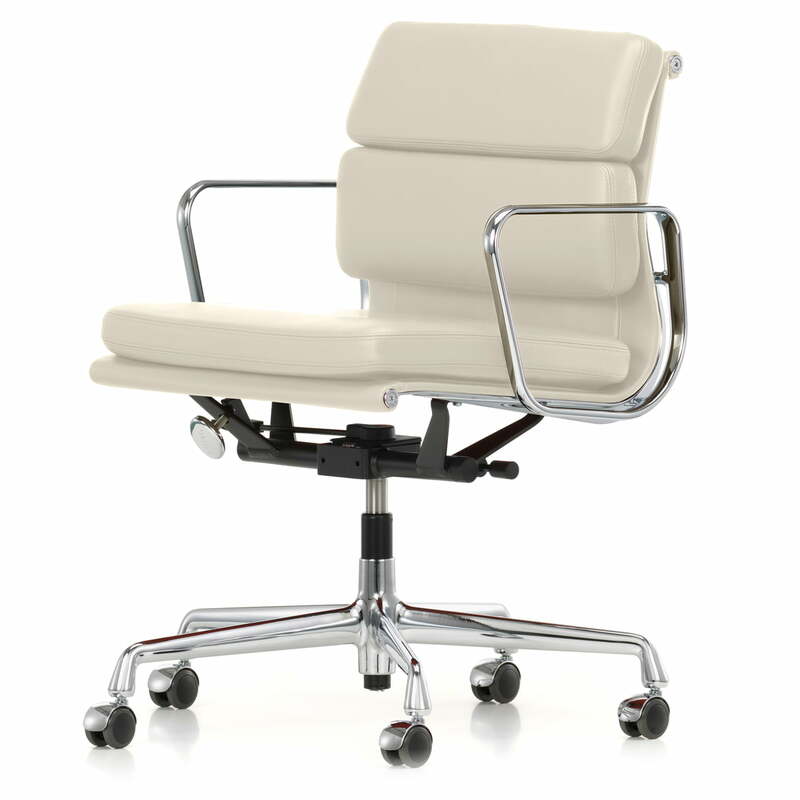 EA 217 is a swivel chair on a 5-star foot with rolls and is manufactured of leather, aluminum and plastics. 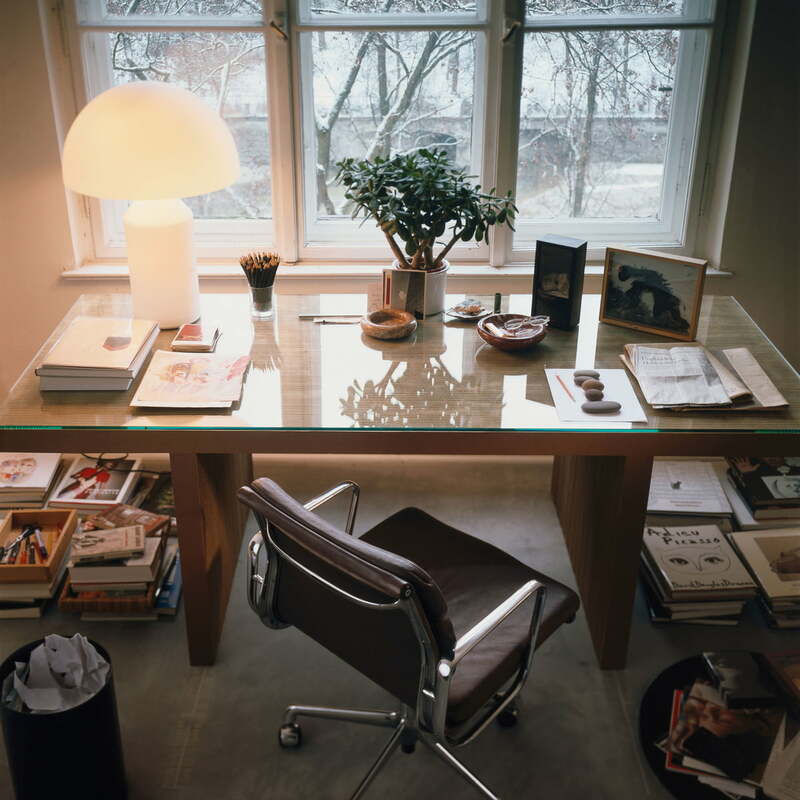 Single image of the Soft Pad Chair EA 217 designed by Charles & Ray Eames for Vitra. 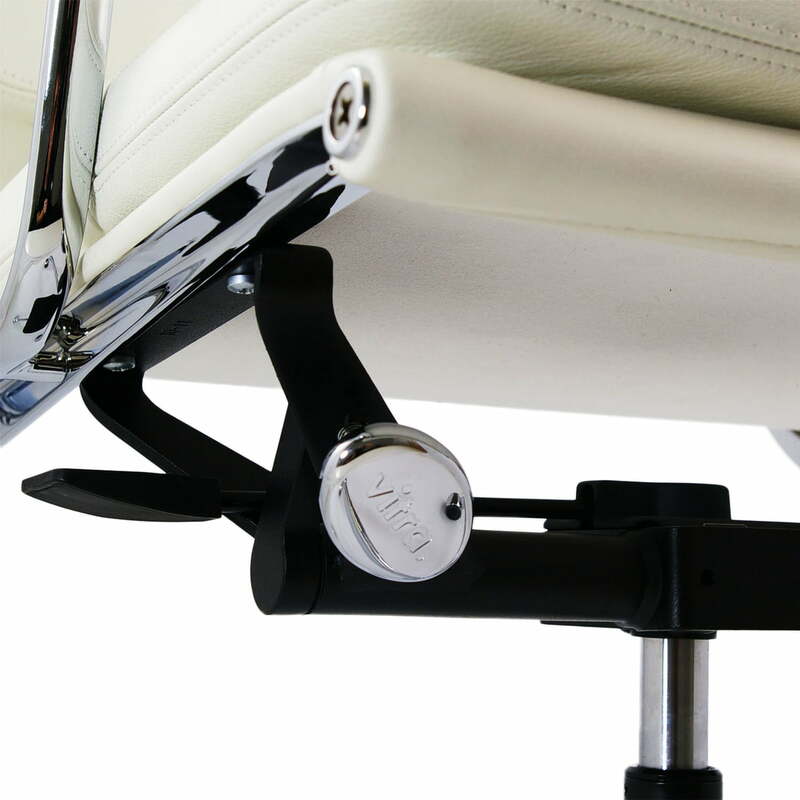 The swivel chair is delivered with soft weels for hardwood floors, it has a height of 41 cm which is step-less adjustable by the gas springs. 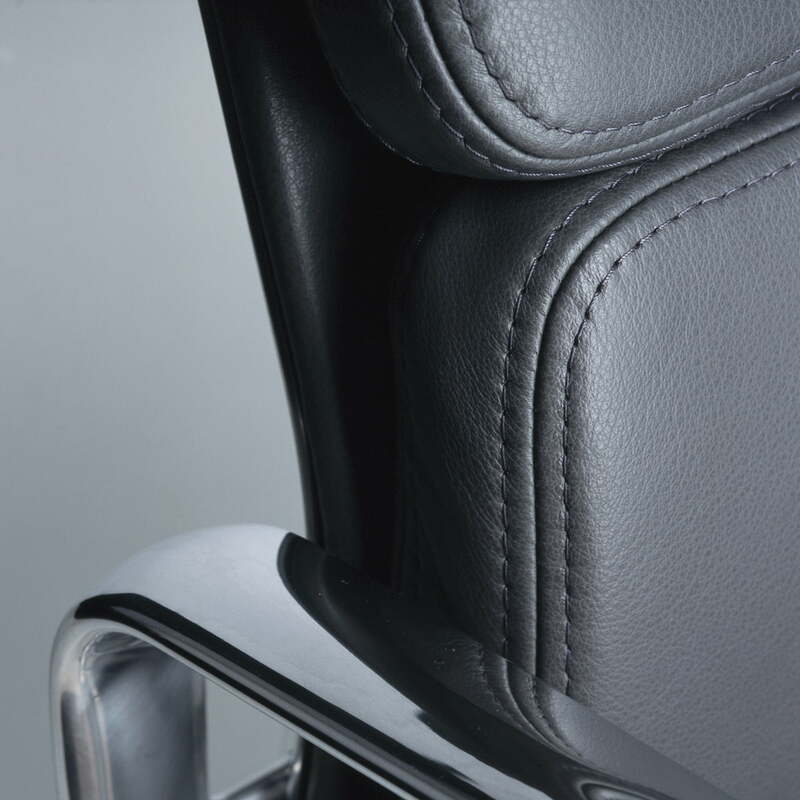 Detail image of the seating upholstery of the Soft Pad Chair EA 217 by Vitra. Due to the sewed upholstery, an interesting contrast to the slim aluminium profile emerges. 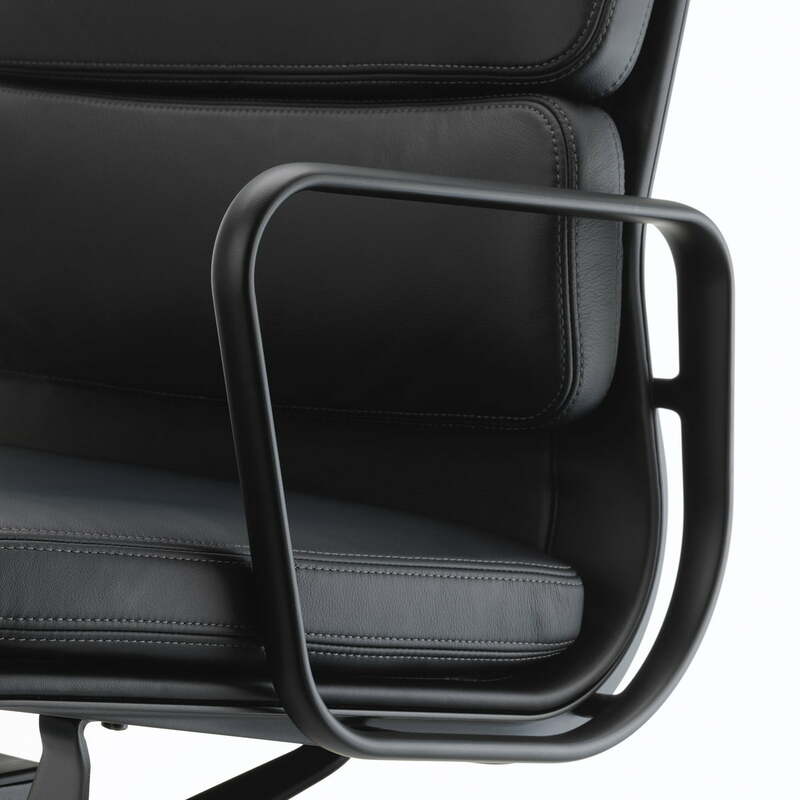 Detail view of the lower frame of the Soft Pad Chair EA 217 by Charles & Ray Eames for Vitra. The models of the Soft Pad Group can be used in many different areas such as the office, conference and entrance rooms and also at home. 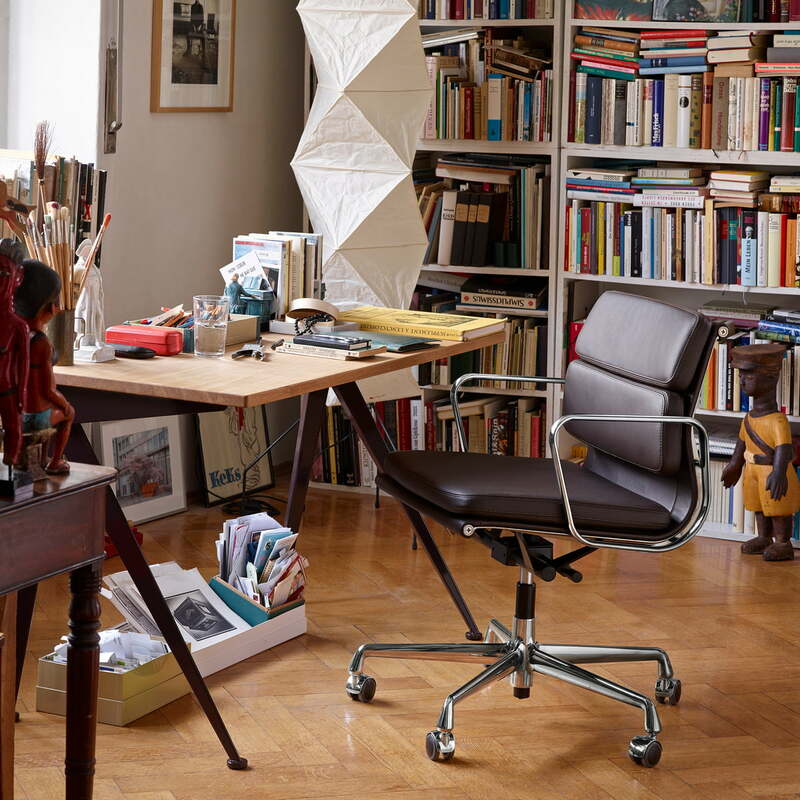 The design of the Soft Pad Chair Vitra office chair dates back to 1969 by Charles & Ray Eames. To this day, it is a timeless classic among the office chairs. 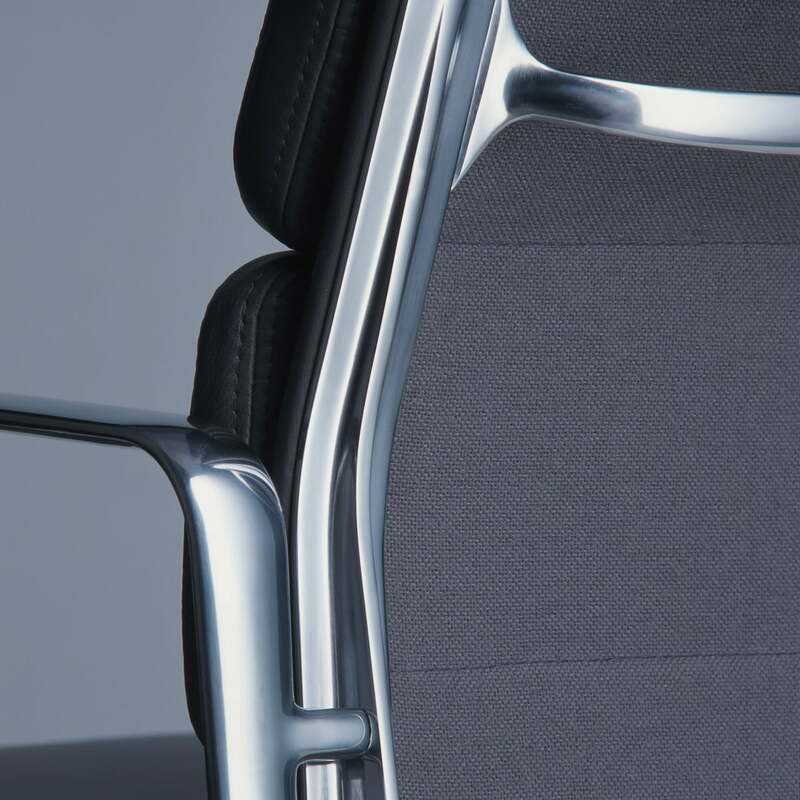 Detail view of the head rest of the Soft Pad Chair EA 217 by Vitra. The design of the Soft Pad Chair has its origin in the year 1969. Its construction and shape is similar to the Aluminium Chair. Close-up of the armrest and backrest of the Soft Pad Chair EA 217 by Charles & Ray Eames for Vitra. 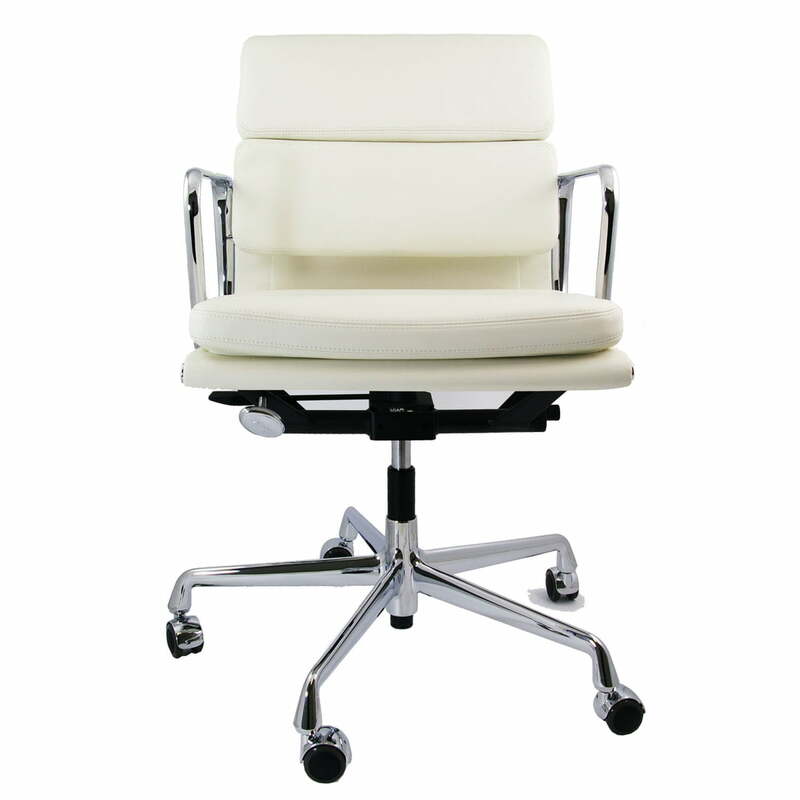 The swivel chair has an overall height of 96 cm and a length of 52,5 cm.